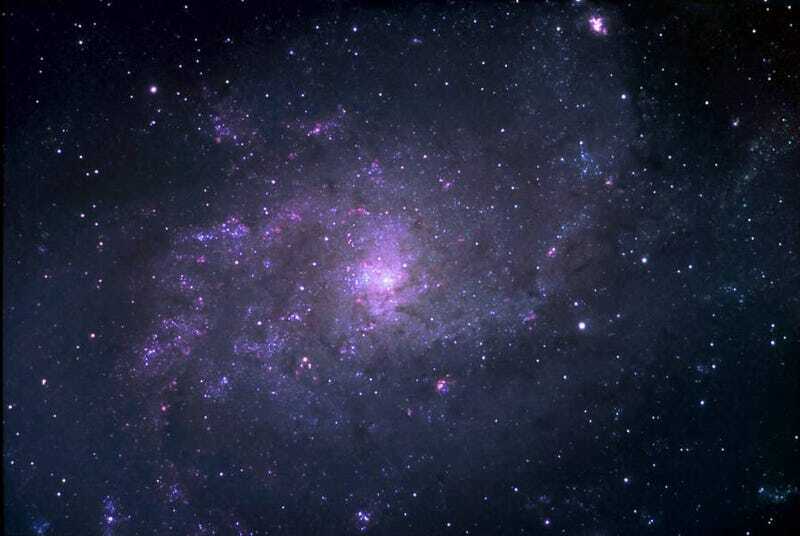 The M33 galaxy is a rare galaxy that's "face on" to us, so we can study its make-up. And it's also blue-shifted, meaning it's coming towards us. But it'll collide with Andromeda before it reaches us. Over in the Naples News, astrophotographer Ted Wolfe, who snapped the above picture of M33, explains what we can learn from this galaxy — including the fact that emission nebulas, like our own Horsehead Nebula, North American Nebula and Swan Nebula, are apparently common in spiral galaxies. Those are the pinkish patches all over the above galaxy. And those emission nebulas are massive star-formation regions.